Peterborough Phantoms skipper James Ferrara is dumped on the ice in the win over Basingstoke. Photo: Tom Scott. Another night, another win for Peterborough Phantoms. The city team stretched their hot streak to 11 games in all competitions when easing to a 3-1 success against Basingstoke at Planet Ice last night (November 4). Tom Norton celebrates his goal for Phantoms against Basingstoke. Photo: Tom Scott. The Bison bear virtually no resemblance to the side which lifted the NIHL Division One South title last season and are highly unlikely to challenge to retain the crown. Despite being billed as underdogs by their head coach Slava Koulikov, Phantoms are much more plausible contenders for glory after missing out on honours so agonisingly last season. “It wasn’t our best performance by any means,” said Koulikov. “But we still did more than enough to win the game. 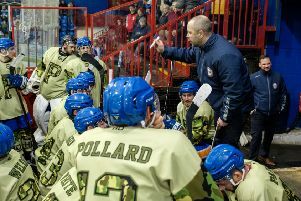 “We all know the big changes that happened in Basingstoke after they won the title last season with their coach and many players moving across to Bracknell, but they have put together another well-drilled and gritty team. Phantoms netminder Jordan Marr makes a save against Basingstoke. Photo: Tom Scott. Basingstoke were close to a short-handed opener as their captain Russell Cowley cracked the bar before Phantoms did succeed in finding the net just as that same powerplay came to an end. Player-coach Tom Norton struck for the third time in two games when unleashing another of his blockbusters from the blue-line which flashed past the head of Bison netminder Alex Mettam before he could react. Mettam twice produced fine stops to thwart Corey McEwen and also excelled to keep out a Glenn Billing effort later in the first period, but he was beaten on two further occasions in the middle session. Petr Stepanek pulled the trigger following a Will Weldon face-off win to double the advantage before Nathan Pollard got in on the act with a hotly-disputed third goal. The forward stormed down the left before finding the target with a shot from the tightest of angles – a scenario which led to angry protests from Basingstoke who appeared convinced the puck had gone through a hole in the side netting. It was a view that even some Phantoms fans agreed with, but the goalscorer, his coach and more importantly the officials were of the opinion it was a legitimate goal. Phantoms were unable to find the net again despite almost half of the contest still remaining. It wasn’t for a lack of trying with Mettam kept busy which one particularly powerful Stepanek blast leaving him winded. The only other goal was a late consolation for Bison import Michal Klejna which denied Jordan Marr a shut-out. He had successfully dealt with the other 24 on-target attempts from the visitors. Koulikov added: “We coughed up the puck a few too many times for my liking in the first period, but our decision-making and game management got much better as the night went on. “There was a bit of excitement for the crowd towards the end with Basingstoke getting a goal back and pulling their netminder, but I was always confident we would close the game out comfortably. “We scored three very nice goals. It’s good to see Tom using his big shot on the powerplay when the window is there and we saw again the power that Petr has when he gets a chance to shoot. Two huge games lie ahead in the coming days for Phantoms. They travel to Swindon on Friday (November 9, 7.30pm) for the second leg of their NIHL Autumn Cup semi-final in possession of a 4-3 aggregate advantage. And Koulikov’s men then welcome leaders Bracknell to Planet Ice on Sunday (November 11, 5.30pm) for a crunch showdown in NIHL Division One South. Phantoms sit third in the standings, four points behind the pacesetting Bees but with four games in hand.